NATIONAL FOSSIL DAY --- Hoping for a volunteer to plan, organize, develop, and celebrate National Fossil Day as an Island event, for people of all ages, at the Oak Bluffs Library, from 4pm-7:45pm, Thursday, October 17th, 2013. Partnership with the Oak Bluffs library is through and with the children’s librarian. Plan far ahead and apply for small grants to pay for renting tables, table covers, with delivery and pick-up. Apply to Stop-and-Shop for food and beverages for the attendees. Need grant money to pay for real ads in the MV Gazette and the MV Times. Work with Gazette and Times for stories and coverage of the event. Plan ahead for books and literature for the library. Plan ahead with the science teachers to make the event support their curriculum needs. Seek out the local citizens who have fossil collections to share their knowledge with the public. Start as soon as possible and work steadily toward the event. Seek sponsors as well as participants and partakers. Support from donors is what makes accomplishments possible. Yet despite the life sustaining importance of fundraising, I have not managed to do the fundraising tasks in a timely manner. So this is an area where I could really use the help of a well organized and motivated volunteer to keep fundraising on track and on timelines. It would be great to have help with our web pages. I would like to tell about our accomplishments, and to do this while it is still newsworthy. Likewise to put onto our bulletin board the talks and other events that are scheduled for future dates, and to have nicely created posters to elaborate on the events. Also there is so much more that we can do on our website to fulfill our mission of education, research and public participation in marine and paleobiological science. Please step up and be a Citizen Science Volunteer to help count spawning horseshoe crabs on lunar high tides in May and June. Click here for 2011 TASHMOO TIMES AND TIDES. Click here for 2011 FELIX NECK TIMES AND TIDES. You can get onto our volunteer lists at any time of the year. The Martha's Vineyard surveys are organized and coordinated by Felix Neck. The data is used by the state fisheries biologists to monitor the health of the horseshoe crab population and the effectiveness of the fishery regulations. MPRI helped to initiate the Martha's Vineyard surveys, and we participate by signing up to do some of the counts. Volunteers experience enjoyable camaraderie, so please identify yourselves and join us. Create educational displays of recently acquired fossils, both teaching material fossils and fossil heritage fossils. Ask the Oak Bluffs Library if we can install the displays on a temporary basis in the upstairs display case; also the Vineyard Haven Library has a display case [the display will need to be tailored to fit the different size/style of display cases in the two libraries; maybe there are other venues also?]. The idea is to get maximum public benefit from these fossil acquisitions. Some research, and photography, and photoshop, and similar effort is needed for each project. Update the on-line bibliography on Paleozoic Asterozoa. A person with library skills might be interested in the project. It is a mix of catch-up word processing on already-found literature to add to the bibliography, and also an opportunity to find other new and old literature to make the bibliography more and more complete. For volunteers who have arts and crafts inventiveness and skills: There are reasons to think that the body wall of a starfish behaves somewhat like an elastic membrane that is supported by a framework of skeleton within the starfish body wall: this leads to the idea of trying to model starfish structure using a wire frame and a soap film: create a frame; dip it into a soap solution; see what shape the soap film makes; try to discover a frame that supports a film that has key features of starfish body form. Like guy wires of a tent, some additional support such as bits of thread as flexible shape-forming members seem needed. It is also desired to figure out a way to make a film that will harden as a lasting structure (because soap films 'pop' and do not last). There is also a second project that constructs a starfish shape from paper strips; the model is flexible but wants to maintain a symmetrical equilibrium shape; starfish in nature are almost 'unnaturally' symmetrical, and it is perhaps because it requires muscular effort for a starfish to be not-symmetrical. 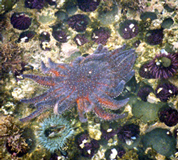 The scientific objectives are to devise simple ways to understand certain features of starfish body form. The educational objective is to come up with an enjoyable activity that teaches about the role of the skeleton in supporting the shape of an animal.